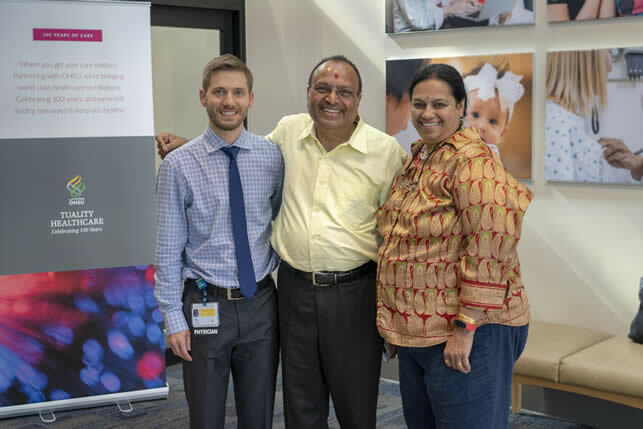 Dr. Lucas Christianson (left) with Prakash Shukla (center) and wife Datta Shukla (right). On the evening of the June 11, 2018, retired Intel engineer Prakash Shukla experienced a sharp pain in his shoulder. Prakash is a healthy and active person who typically exercises for an hour and a half each day, so he assumed he sprained a muscle during one of his workouts. However, after a while, the pain began to move down his arm and he began sweating profusely. His wife called his son who is a doctor in California and he instructed her to call 911 immediately. The moment he arrived at OHSU Tuality Healthcare, he was impressed with the care and attention he received. “When I arrived, I was seen right away and everyone knew what to do”, said Prakash. His EKG was reading normal, but cardiologist Lucas Christianson, M.D., ran more tests and concluded that Prakash was experiencing a heart attack. Shukla was deeply impressed with the communication he received from Dr. Christianson. “I’m an engineer. I always have a lot of questions and want to know why things are happening.” Dr. Christianson explained the procedure thoroughly to Prakash and his family. “Dr. Christianson made me feel so comfortable. He made an effort to take time for me and my family”. Prakash was not only grateful for the attentive care he received from Dr. Christianson, but was blown away by the level of care he received from nurses Andrea Gilliland and Christie Schleich. “I’ve never had that kind of care before”. A few years ago Prakash had been hospitalized for an ulcer in another state. In his past experience, when he would press the button for assistance, the nurses were either delayed or would never respond. Prakash was very impressed with all of the detail that was put into his care and comfort. To him, OHSU Tuality Healthcare “felt like home”, and to honor the staff that supported him, he recently made a generous donation to the Tuality Healthcare Foundation on behalf of Dr. Christianson and his nurses Andrea and Christie.